Based on reviews from 1 experts and 66 users. Learn how our rankings work or see our guide to Diadora football boots. Updated Apr 2019. Enduring through the years, the Diadora brand has never forgotten to look back and remember where they came from. A strong connection to their heritage is evident in the creation of their products with the brand actively opting to retain their manufacturing plants in their home country, Italy, while never passing the opportunity to show their origins in their boot designs. The brand has even gone as far as featuring the Italian flag in Diadora football boots. Marcello Danieli founded the brand in 1948, but it wasn’t until the seventies that marked the introduction of Diadora football boots into the market. The brand’s very first spokesperson and consultant in the creation of their football boots is the former football star, Roberto Bettega. The partnership proved to be the most fruitful for the brand as it afforded the company the knowledge on how to approach cleat construction. Since then, the brand has created partnerships with top athletes with the likes of Francesco Totti, Filippo Inzaghi, and Martin Jorgensen. And not just individual athletes but whole leagues as well. Leagues sponsored by Diadora includes Colchester United, Preston North End, and even the Kazakhstan National Football Team. As if staying true to what the brand name means (which is to share gifts and honor), what Diadora football boots bring are quality much like a gift and aiding performance for a winning game. With the fierce competition in the football market with giants like Adidas and Nike, it’s fairly easy to get drowned out. But Diadora football boots have managed to stand their ground and stay afloat through the years by never forgetting their Italian origins and creating quality football cleats. Since the brand entered the football market, Diadora is bound to make innovations in their football boot construction - and they have. Technologies for the upper up to the shoe’s outsole have been invented by the Italian maker, elevating the player’s experience on the pitch during play. Touch Control. A technology applied to the upper of Diadora football boots which enhances ball touch and control. Created from webbed nylon that results in a board with flex grooves, this material is also designed to be lightweight. The models with this shoe technology include DD NA4 GLX14 and the Macarana LT MG 14. SuprellPro3L. With an extremely thin composition, the SuprellPro3L material is created from a unique microfiber. Fused into the external and internal upper, it brings a one-piece construction that adapts to several foot types. The DD NA4 GLX14 and the Brasil MDPU are just some of the football boots with this technology. Morpho Cage S. This heat-sealed TPU mechanism acts as an internal cage for the player. While enclosing the foot, it evenly distributes pressure which enhances stability during thrust. This technology is evident in the Diadora DD NA GLX 14 model. Microbe Barrier. A useful feature in preventing bacterial growth in the shoe is the Microbe Barrier. It is a treatment applied in Diadora football boots’ insoles to promote a healthier foot environment. Models with this feature include the Brasil Italy OG MDPU, Diadora Italica K-Pro MG14, and the Diadora DD NA MPH football cleats. Double Action. Also known as the DA system, the Double Action system acts as the brand’s shock-absorbing technology for Diadora football boots. This system comprises of an elastomer placed in the heel area (meant to absorb shock) and the forefoot (which enhances forward thrust). While aiding injury prevention by absorbing shock, the system also distributes pressure evenly throughout the foot and observes shoe flexibility. Diadora football boots with this feature is the Diadora Brasil Italy OG. Axeler. Facilitating the natural movement of the foot to improve performance, Diadora football boots with the Axeler technology makes use of a thread-like frame In Tech Alloy. With a lightweight, flexible but tough composition, it is inserted into the sole which in turn increases the shoe’s flexibility, without losing stability. The Brasil Axeler football boot is one example of the shoes sporting this technology. MG14 outsole. This outsole type uses 14 conical-shaped studs to improve pressure distribution, promote stability and improve abrasion resistance. A circular stud layout used improves spring. Diadora football boots with this technology includes the Diadora Brasil LT MG14, M. Winner RB LT MG14, and the Diadora Tri-7 MG14 models. Net Breathing System. This Net Breathing technology can be found in the Diadora DD NA4 GLX14. As implied by the name, this technology is designed breathability for Diadora football boot’s. The material is created from a synthetic net fiber which is breathable and designed to be waterproof. In developing their products, there are several Diadora football boot series that showcase features catering to specific players on the field. Starting with the series closely associated with Series A players is the Diadora LX. With a namesake adapted from the Roman numeral standing for 60, this number is meant to celebrate the brand’s 60 years in the industry. Other notable Diadora football boot series include the Diadora Brasil, Diadora Maximus, and several others. The LX title is taken from the Roman numeral which stands for the brand’s 60th anniversary. A collection mostly associated with top football stars with the likes of Francesco Totti and Massimo Ambrosio, expectations are high for this series. While this silo's crown jewel is the Diadora LX K-Pro football boot, the line also offers low-tier models that still checks out in terms of performance and affordability. The creation of the Diadora LX K-Pro is the brand hitting two birds with one stone. Specially designed for the legendary Striker, Francisco Totti, this shoe not only celebrates the player’s association with Diadora but it also marks the company’s 60th anniversary. This elegant looking Diadora football boot is available in a gold-black colorway integrated into the supple kangaroo leather upper. This foot-hugging, moldable material lends way to comfort and performance on the football field as it is known for its ability to enhance ball control and touch. The heel area has the brand’s Morpho cup technology which boasts foot adaptability while an MG14 stud pattern is designed for traction in natural and synthetic courts. Flex and increased propulsion are also accommodated through this Diadora football boot’s Axeler technology in the outsole. Similar to the Diadora LX model in more ways than one, the Diadora Maximus RTX 14 offers the premium experience for its players. Sported by Totti before moving on to the LX K-Pro model, this shoe also sports a light kangaroo leather upper with the fold-over tongue. This design is especially useful for attacking midfielders and strikers due to the enhanced level kicking surface. In addition to the high-end upper is Diadora’s Axeler outsole technology which is designed to boost reactivity. Player injuries are also minimized with the help of the shock absorbing EVA foam insole. Aptly named, the Diadora Brasil Axeler RTX 14 football boot has elements from Diadora’s Brasil collection fused with the brand’s Axeler outsole technology. This is a unique combination as the Brasil line is usually for amateur players while the Axeler technology is commonly associated with Diadora football boots that belong to the professional game. This model brings the best in both worlds. Looks can be deceiving when looking at this Diadora football boot’s exterior. While it has a fairly straightforward design, looking under the hood would prove otherwise. Technologies used in this shoe’s creation includes a lightweight kangaroo leather upper as well as a breathable Air Mesh material. Reinforcing shock absorption is the Double Action and Engage material integrated into its construction. The outsole, unsurprisingly, uses the Axeler technology fused with a titanium frame which promotes stability while maintaining flexibility. Reimagined in 2016, the Diadora Brasil SPA football boot has the air of a true classic shoe with all the modern innovations. As part of the ‘Made in Italy’ release, this heritage model sports a full-grain kangaroo leather upper which stretches and molds to the player’s foot creating a truly personalized fit. While the material is soft, it also provides an excellent ball touch and control due to its thin composition. This Diadora football boot’s design espouses a mini fold-over tongue reminiscent of classic football boots. Velcro has been used to keep it in place. As if declaring what the boot is meant to stand for unknowing users, the word ‘brasil’ is stitched in, along with the Italian flag on the boot’s upper. Together with a low-profile stud configuration, this iconic-looking cleat is one for patrons looking to celebrate Diadora’s Italian heritage. Known as Diadora’s speed silo, the DD-NA series is designed to be lightweight for fast players on the pitch. Several releases have been made for this collection with improvements made after each release. A slew of technologies has been incorporated into these Diadora football boot models to keep it lightweight while maintaining optimal boot performance. The latest release comes with the Diadora DD-NA GLX14 model. This Diadora football boot is made lightweight with the use of SuprellPro3L technology which also allows for a better ball touch. 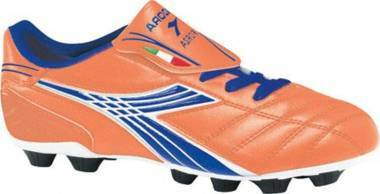 What sizes are available for players looking to wear Diadora football boots? Diadora football boots are available in men/unisex, women and children’s sizes. Diadora’s official site has size charts available to view sizes in UK, UE, US, and JP versions. What are the benefits of using kangaroo leather for the upper? A full-grain kangaroo leather upper is highly prized for its softness and moldability. It is known for bringing a comfortable fit fresh out of the box and needs little to no time for break-in. Over time, the material also molds to the shape of the wearer’s foot allowing for a personalized fit.